Home	> 10. RALBAG/ PEIRUSH CHAMESH MEGILOS. 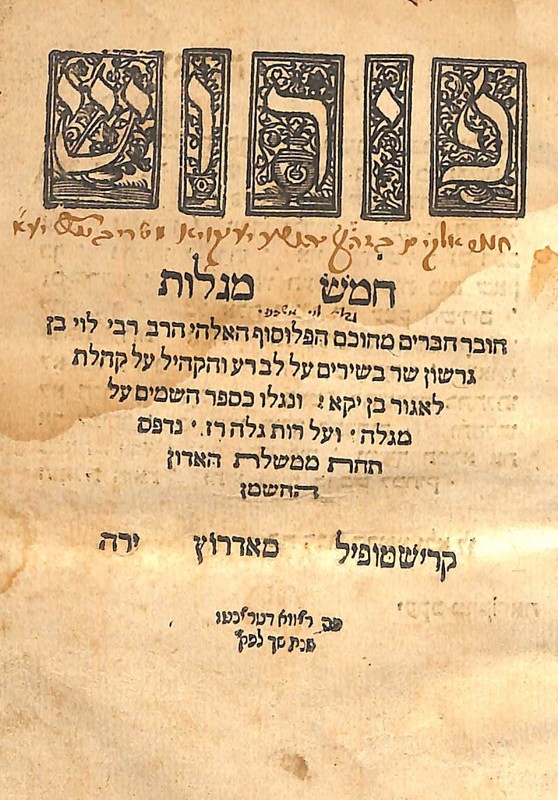 FIRST EDITION, RIVA DI TRENTO 1560. 10. RALBAG/ PEIRUSH CHAMESH MEGILOS. 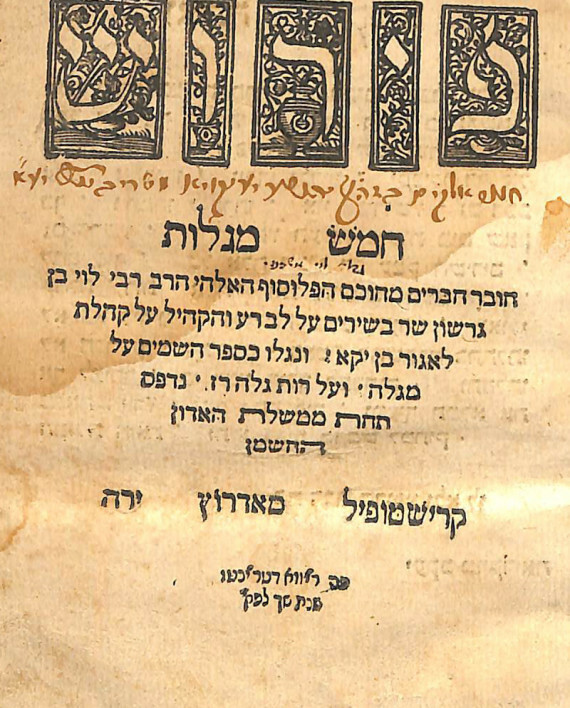 FIRST EDITION, RIVA DI TRENTO 1560. Comprehensive commentary on the Five scrolls by the RaLBaG. Although the book is titled commentary on the five scrolls, in fact there is no printed material on Lamentations. See the publisher’s introduction where he considers that perhaps the RaLBaG did not actually write a treatise on Lamentations.  Rabbi Levi ben Gershon (1288–1344), known by the abbreviation of RaLBaG, or in Latin as Gersonides was a Talmudist, philosopher, mathematician and astronomer/astrologer. A scion of illustrious rabbinical family he is best known for his commentaries on certain books of the Bible. He is also credited with having invented the Jacob’s staff, and the Rabbi Levy crater on the moon’s surface is named in his honor. Vinograd Riva di Trento 23. Jacob Marcaria publisher. 50 pages 18.5 cm. Fine condition, damp stains throughout, trace worming not affecting text, small tear to title page not affecting text. Modern binding.